Curated by Michael Pinsky and Stephanie Delcroix and set in the King’s Cross development, Of Soil and Water: The King’s Cross Pond Club celebrates the power of nature to regenerate itself and to modify human behaviour in the heart of the city. Berlin-based artist Marjetica Potrc and Rotterdam-based architectural duo Ooze have moulded a mound and basin from the earth and water available at the construction site. Whilst the mound and its surroundings have been planted with wild flora and meadow species, the basin is populated by halophytes, which have the capacity of filtrating impurities and turning its waters into a swimmable area. On any given day, the plants’ maximum cleansing power limits the number of human beings ‘taking the waters’ to 163. Bathers climb up the mound in order to access the pond. Upon entering and leaving the water, they are exposed to the scrutiny of residents and passers-by. Once immersed in the protective waters, their gaze levels with that of onlookers unsettling the relationship between the observed and the observer. Of Soil and Water posits the fragility of building sites as places in transformation in contrast to the self-regenerative power of nature thus addressing the value of land versus that of nature in the contemporary global city and the equilibrium human beings need to find between the two. The installation will open to the public in May 2015. 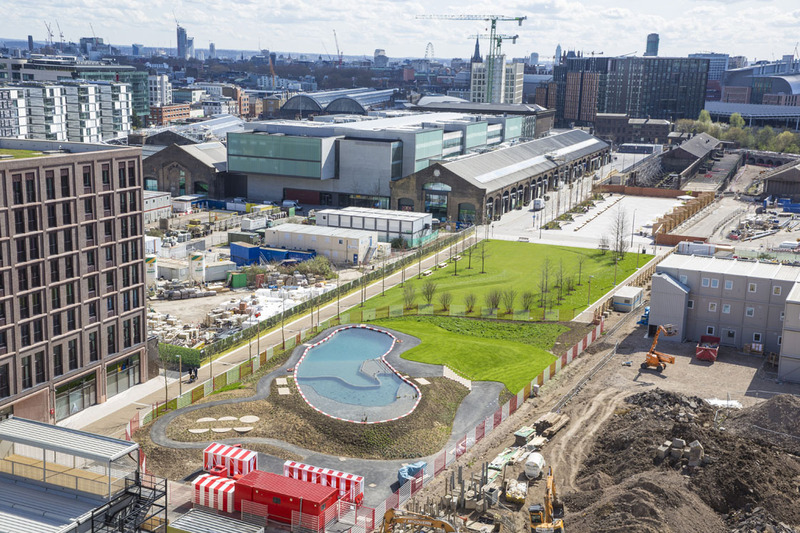 Please visit http://www.kingscross.co.uk/kings-cross-pond-club for an update on the opening date and hours.